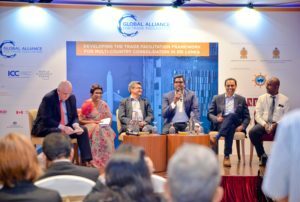 Minister of Development Strategies and International Trade, Malik Samarawickrama, together with representatives from Sri Lanka’s public and private sectors came together last week to launch a new trade facilitation project to develop the framework for a multi-country consolidation (MCC) hub. Panel discussion at the launch event. The project aims to support Sri Lanka in becoming a world-class trade hub in the Indian Ocean and in implementing the World Trade Organization’s Trade Facilitation Agreement. MCC is a cost-effective solution that optimises cargo flow by consolidating shipments of multiple shippers from multiple origins at an intermediate point to build Full Container Loads (FCL). MCC offers traders flexibility, lower transit costs and more efficient service. The project will see the introduction of the legal, regulatory and operational reforms required to implement multi-country consolidation at Sri Lanka’s main ports. These include reducing the number of documents required by shippers to pass through customs, improvements to the in-bond regime that facilitates the movement of goods between the port and MCC warehouses, and greater use of MCC authorised operator schemes. A world-class MCC hub will greatly improve export competitiveness and provide an access point to global supply chains to the direct benefit of small and medium-size businesses. Other benefits from MCC hubs also include increased employment and tax revenues. The Global Alliance for Trade Facilitation, which is supporting the project, is a not-for-profit venture which brings together governments and businesses to identify opportunities to improve trade facilitation, such as reducing delays at borders and removing unnecessary red tape, and implement targeted reforms. “This project will have a significant long-term impact for Sri Lankan businesses, particularly SMEs. A globally focused MCC operation will mean firms can access better rates when exporting abroad, giving local companies an access point to global supply chains that are presently unimaginable for Sri Lanka. “Sri Lanka is ideally positioned to become a logistics hub in the Indian Ocean. Making this a reality has been a politically bi-partisan aspiration and vision for almost four decades. “Whilst it has been substantially realised with respect to the transhipment and hubbing of full containers over the Port of Colombo, the full potential of doing so with respect the cargo within the containers is largely untapped. This project proposes to bring together stakeholders to identify regulatory hurdles to achieving this vision and develop collaborative ways to overcome them.